To some students young and old, present and former, she is "Mrs. Bierman." Other students have graduated to "Carol." To my kids she is "Nina," short for Nonnina, which is Italian for "little grandmother." To my dad she is "Goldee" because she is good as gold. I made dinner for her birthday last night. I picked every rose in the garden and we ate out on the deck. I even broke out the "good" white tablecloth because really, what are you waiting for? It was an evening of old faves. For starters there was watermelon salad, tomato-basil salad, garlic bread and white wine. 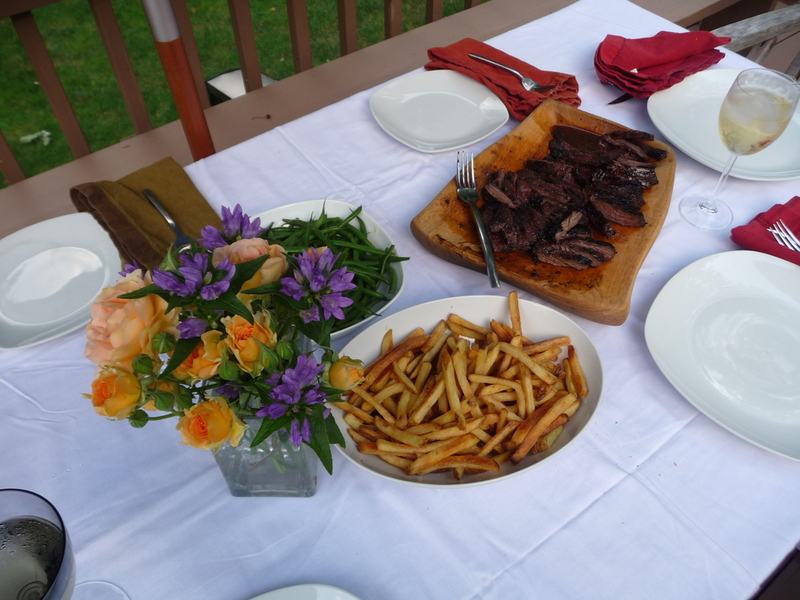 For dinner I made skirt steak, fries and steamed green beans. All I know about gardening, cooking, parties and dancing, I learned from my mother. When I grow up, I shall be just like her. Or perhaps I am already there.